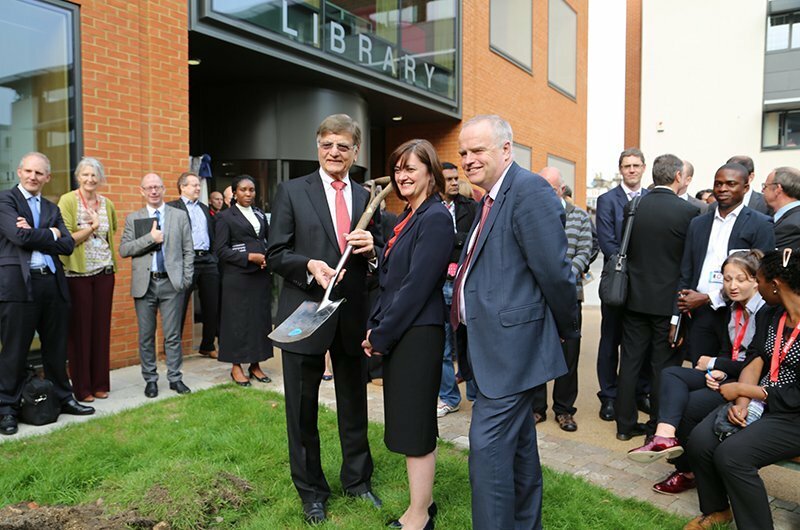 The new Library at the University of East London's Stratford Campus was formally opened by local and University dignitaries today. Lord Noon MBE, UEL's Chancellor, presided over the unveiling of a commemorative plaque and burying of a time capsule together with Professor John Joughin (UEL's Vice-Chancellor), Lord Patel of Bradford OBE, the University's Director of Strategic Partnerships and Senior Advisor to the Vice Chancellor, and students, faculty and staff of the University. "Delighted with the new library at Stratford…looks very well indeed. High quality, great appearance and a splendid range of learning spaces. Great mix of automation and the traditional. The attention to noise control has worked really well. Sustainability outstanding. Value for money as well. A considerable achievement all round." The £8.6 million building was built for £2000 per m2 and features space for 150,000 items of stock and includes a 24-hour cafe, study areas and a new outdoor courtyard.